Black skimmer is an instantly recognizable bird which is best known for its remarkable beak. It is the largest among the three skimmer species. The bird is easily identified by its black and white underpants (Burger, Joanna, et al., 2017). However, in winter the body and head of the bird becomes slightly grayer. The animal belongs to the Loridae family and Rynchpos genus. The bird has long, deep and flattened blade-like mandibles. The upper mandible is shorter than the lower mandible. It has short legs with webbed toes. The birds are popular along the Atlantic Coat of Massachusetts in the United States, Gulf Coast of Florida and Northeastern Mexico. During winter the birds migrate to the South Coast of Central America. The black skimmer lives in coastal waters free from open waves. Such habitats include bays, estuaries, creeks, inlets and tidal pools. Nesting takes place on sandbars, shell banks, salt marsh, sandy beaches and dredges islands. When the water levels are lowest, the bird uses coastal beaches, islands, estuaries, and lagoons (Burger, Joanna, et al., 2017). The bird can go up to 3,800 meters on the shore of the coastal water bodies or lakes. Black skimmers can live for up to 20 years but start to breed one year or three years. The beak and the neck of the bird are relatively long to maintain its body position above the water surface while looking for the prey. The bird usually feeds on crustaceans, small fish and mollusks. The edges of the beak are knifelike to allow it grasp slippery prey. In addition, it has strong neck muscles that enable it to pull the pray out of the water surface. Crows are the primary natural predators of the black skimmer. Other predators include dogs, cats, gulls, and rats. They feed on eggs and chicks. However, the birds have natural adaptations to help them protect their chicks and eggs from the predators. Black skimmer is usually active at dusk and dawn to allow it defend its chicks and eggs from the predators. The birds can travel up to five miles offshore in search of food. The birds have a wingspan of 42 to 50 inches that they can use to cover their chicks and eggs. Black Skimmer has vertical pupils that can roll during the day into narrow slits that protects the eyes from the sun (Burger, Joanna, et al., 2017). The birds fly close to the water surface. They keep their beaks open while the lower mandibles are submerged into the water to detect prey by a sense of touch. After identifying the prey, the bird quickly catches the prey by closing its beak. Black skimmers are monogamous birds (Fern, 2013). They live in large colonies, and the parents ensure that the eggs are taken care of during incubation, and the chicks are safe after hatching. The birds’ lays two to five eggs to increases the chances of survival if the predators destroy some eggs. Black skimmers are primary carnivores (primary consumers). The primary diet of the birds is composed of marine prey and estuarine fish. Male black skimmers are heavy feeders compared to females. They are migratory birds. The female black skimmers feed heavily during the non-breeding season. However, the environmental change affects the avian life history traits of the birds as a result of trophic segregation (Burger, Joanna, et al., 2013). Predators associated with human are a significant threat to the animals. Increased human settlement along the rivers, increasing use of beach habitat, depletion of fish stocks, and collection of eggs poses a significant threat to the birds. Some of the colonies are being displaced from their natural salt marshes and beaches due to oil exploration. However, the birds are quite adaptable since they can change their nesting feeding sites when invaded by humans or other predators (Burger, Joanna, et al., 2013). They are adapted to endure heavy predation and natural disasters by re-nesting and changing colony sites. Burger, Joanna, et al. “Stakeholder contributions to assessment, monitoring, and conservation of threatened species: black skimmer and red knot as case studies.” Environmental monitoring and assessment 189.2 (2017): 60. Burger, Joanna, Bori L. Olla, and Howard E. Winn. Behavior of Marine Animals: Current Perspectives in Research. Marine Birds. Springer Science & Business Media, 2013. Fern, Rachel. 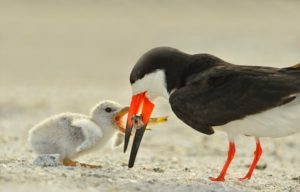 Reproductive Success of Nesting Terns and Black Skimmers on the Central Texas Coast. Diss. 2013.